Logitech headsets are ready for all-day use, with ultra-lightweight designs and high-performance audio. Wideband audio with enhancements like DSP, echo cancellation and noise reduction provides a fatigue-free calling experience. 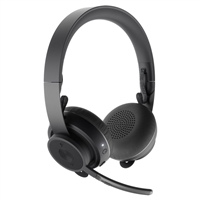 Logitech's business-class headsets are ready for your computer, laptop, phone or other compatible telephony source.